The two sides appear to be at loggerheads, with both making long lists of demands the other won’t meet, analysts say. Trump wants China to cut its annual trade surplus with the U.S. by at least $200 billion by the end of 2020 and not retaliate for U.S. tariffs. China wants the U.S. to stop an investigation into the country’s acquisition of sensitive American technologies. While a cure-all deal was always a longshot, the discord between the world’s two biggest economies means skittish global markets will continue to face trade tensions. The immediate question is whether the U.S. saw enough progress to delay Trump’s planned tariffs on Chinese imports. The duties can be imposed after a public comment period ends May 22. The White House characterized the talks as a “frank” exchange and said the U.S. delegation in Beijing stressed that fairer trade would help boost economic growth, even for China. Trump will “seek his decision on next steps” after a briefing from the delegation, according to the White House. The president hinted his administration will take action. Experts had expressed doubts that Trump’s team would make a breakthrough, given the differing ideologies within the large U.S. delegation. 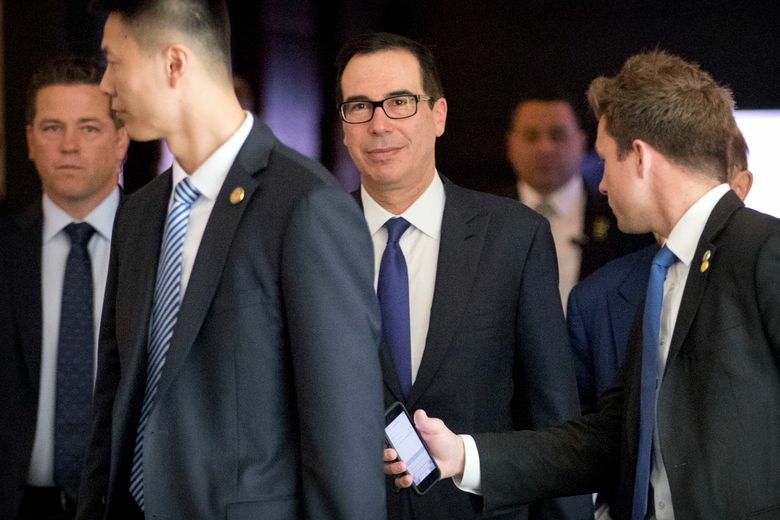 Mnuchin was joined by Commerce Secretary Wilbur Ross and U.S. Trade Representative Robert Lighthizer, as well as two senior White House officials — economic adviser Larry Kudlow and trade adviser Peter Navarro — and the U.S. ambassador to China, Terry Branstad. “The size and high level of this delegation illustrates the importance that the Trump administration places on securing fair trade and investment terms for American businesses and workers,” according to the White House statement. China’s Vice Premier Liu He had earlier requested that the U.S. designate a single point person for the economic relationship. China’s official Xinhua news agency reported Friday that both sides reached a consensus on some trade issues while acknowledging major disagreements on other matters. It said they would continue talks. In an editorial, the official China Daily reiterated that President Xi Jinping’s government won’t back down from its agenda in the face of pressure from the U.S.